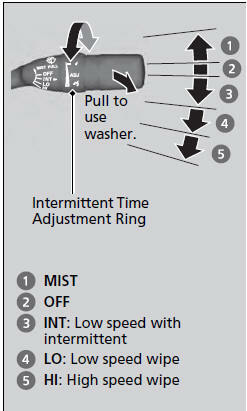 Turn the adjustment ring to adjust the wiper delay. If the vehicle speeds up while the wipers are operating intermittently, the length of the wipe interval shortens. When the vehicle starts moving, the wipers make a single sweep. The wiper operation of the shortest delay setting ( ) and the LO setting become the same when the vehicle speeds up.